We do greatness and we furnish it with our clients over the world. we likewise do the most excessive and most lavish bedroom you will ever experience. 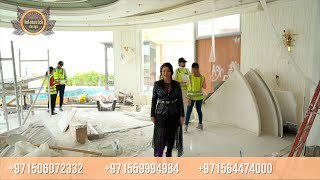 Be astounded by your very own bedroom through the assistance of the skilled plans of our honor winning company in Dubai. Hues are vital to us and we organize each shade that we put in the style. In this new advancement by our expert designers, we used blue and white hues to give a feeling of brilliance. Its style is eminent and first class. Everything about put into much thought as to not veer off from the extravagance structure of this bedroom. You are unquestionably on the correct hands with our ever popular company. Who doesn't love a spotless and slick bedroom? All things considered, in Luxury Antonovich Design, we make not simply the cleanest and slick bedroom. Never feel alone with this momentous bedroom made for the best in the nation. It summons class and complexity, yet likewise, required it to feel brilliant while keeping up a dash of its luxury feel. Diverse shades of white and blue are used to give truly necessary magnificence. Using white into your home arrangement doesn't have to overwhelm the exhausting feels of the usuals. White can be such a quieting shading when coordinated with the right hues; simply like this plan with blue and grays. We made a calm room that is immaculate to live in for a minute, and fusing blue in the hues did similarly as incredible. This inside plan can be the perfect unwinding space for an extravagance space, bringing just the best in the inside structure. Since the room has a mix of warm hues and smooth accents, we made a structure that incorporates interest and makes a great place. The general inside plan can bring a classy vibe into your space. It is the perfect feature in your alone time, and when joined with astounding lighting, we made a smooth arrangement of accents with the most amazing inside plan you will ever observe. This tone naturally feels sublime and superb. This inside structure is flawless and refined. Anything with Luxury Antonovich Design would look extreme. You have seen particular spaces with jumbled structure in them, and you have seen a few structures that went to squander as a result of an absence of arranging. Worry no more since we give the best ace arranging in your rooms! Without a doubt, even this extravagance room couldn't escape from the extravagance enthusiasm of structure! We keep on giving elaborate formats that are continually winning.